I can barely believe that I’m typing these words, but last week Deadline broke the news that I have been sitting on since last November: None of the Above has been optioned for a TV series by Lifetime, with an absolute dream team writing and directing! 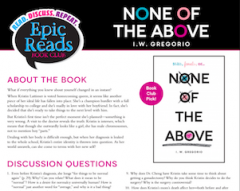 Back when None of the Above first came out last year, the reader question that amused me the most was “When are they going to turn it into a movie?” Because as much I believed in my story, I had absolutely. No. Expectation. That this would ever be an option (hah, see what I did there?). 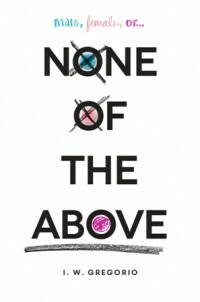 Even before the book came out, I was apprehensive that None of the Above faced a glass ceiling. My fears were confirmed when a publishing sales representative told me somewhat offhandedly, “your book is a tough sell” – because of the lack of awareness of what intersex was (I should note that another sales representative kindly reassured me that it would do “very well”). None of the Above, I absolutely thought, would never have enough mass appeal to the point where Hollywood would come calling. When my literary agent told me that I had a film agent that was interested in shopping the book around, I smiled and nodded and did not for a second think that anything would pan out. Which is why, when I got an e-mail from my agent last July saying that they had a production company and screenwriter who was interested, I freaked out. I had a great conversation with the producers, and then the lovely screenwriter Liz Maccie, but even then I thought everything was still a pie in the sky (one of my MIL’s to-die-for pumpkin pies, maybe, but still a longshot). Despite their interest – and Liz’s husband Stephen Chbosky’s interest (fangirl alert!!) in directing the adaptation – it became very clear that there were still hurdles to overcome: they were aiming for a TV series, so even though there was a production company and writer, what they really needed was a network/studio committed to developing the project. Sure, the TV landscape is far different and more accepting of LGBTQIA themes than even two years ago: Transparent, I Am Cait, Orange Is The New Black. MTV’s Faking It even features an intersex character, Lauren that is an exceptional representation (the showrunners worked closely with interACT youth). Even that, however, didn’t mean that a network would be willing to take a risk on a show revolving around an intersex teen. Until they did. I was sitting in a room full of teens, wrapping up a visit with the Downingtown High School book club, when I got the e-mail: Lifetime was going to make an offer on None of the Above. To get a sense of why I’m so excited that Lifetime is developing the story of my heart, you can read this excellent Hollywood Reporter summary of their upcoming slate, which talks about how Lifetime has become a real “fempire” (73% of their shows were written or directed by women), or read this fabulously in-depth Buzzfeed article on the Lifetime television renaissance. This is not to say that there aren’t even more hurdles to overcome – the pilot script needs to be accepted, filmed, and then picked up as a series. But my little dark horse of a book has already traveled stratospheres beyond my expectations. It’s a moment that I never dreamed could happen, at a time when our country – our world – so desperately deserves to hear stories of compassion, empathy and acceptance. I’m keeping my hopes realistic but my fingers crossed. So stay tuned, dear readers, and thank you from the very depths of my soul for your incredible enthusiasm for the book of my heart!